Sorry... the 2017 Jeep Wrangler is no longer being sold as new. Instead, take the first step to a great deal on 2019 Jeep Wrangler with a free price quote! 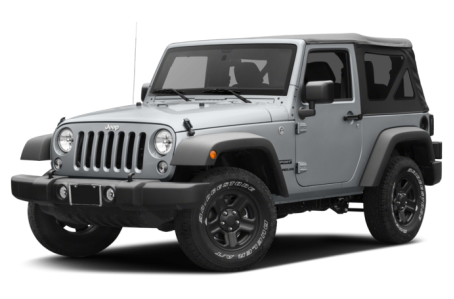 The 2017 Jeep Wrangler remains arguably the most capable “out of the box” off-roader you can buy today, ready to traverse any terrain from the moment you drive it off the lot. The 4-door Wrangler Unlimited will be covered in a separate overview. It has three trim levels: the Sport, Sahara, and Rubicon. The Wrangler’s styling remains unique; it is very easily recognizable with its upright stance, seven slot grille, and giant fenders. This year, the Wrangler and Wrangler Unlimited gain newly available LED headlights and front fog lights. Much of the Wrangler can be removed; the doors and roof come off after you loosen a few bolts and the windshield can fold down as well. Wheels range from 16-18 inches in size, with a full-size spare mounted on the rear gate. Fog lights are standard, with side steps for easier entry and a hardtop (still removable) optional. Under the hood, the Wrangler uses Chrysler’s ubiquitous Pentastar 3.6-liter V-6 which makes 285-hp. It comes mated to a six-speed manual or five-speed automatic transmission. Four-wheel drive comes standard, with plenty of extra mechanical upgrades available like a 3.73 or 4.10 axle ratio, a rear-axle locker, and a sway bar disconnect system. Inside, the Wrangler’s cabin opts for function over form, with a rugged aesthetic that carries over from the exterior. Standard features include satellite radio, an 8-speaker stereo, cloth upholstery, and an auxiliary audio input. Also available are air conditioning, a 115-volt power outlet, navigation, an Alpine stereo, leather upholstery, and heated front seats. 50 of 51 (98%) consumers said they would recommend this vehicle to a friend.